This is the gravestone of two of my maternal great-grandparents, George and Ursula Bellan. George (born Beljan) and Ursula (born Benicki) were born in the 1870s in Croatia, which was at that time a part of Austria-Hungary. They came to America in the 1890s and settled in Cleveland, Ohio. They had eight children, three of whom unfortunately died as teens and young adults. Ursula passed away in 1946 and George followed in 1954. They are buried in Cleveland's Calvary Cemetery. I requested a photo of this gravestone through FindAGrave.com. I was quite surprised when I saw it. My great-grandfather's first name is spelled 'Juraj,' which is the Croatian equivalent of George. (It is prounouned YOO-rahy.) On every census form, children's birth record, immigration document, obituary, etc. he is 'George,' so I find it interesting that his gravestone says 'Juraj.' What is even more interesting is that his Croatian first name IS engraved, but NOT his Croatian surname, Beljan. Did he choose this form of his name to be engraved? He passed away after his spouse, and since they oftentimes do the majority of a stone's engraving all at once, it IS possible that he chose this name. Also of note is that Ursula's birth year on the gravestone is incorrect according to other sources, such as her death certificate and census forms. The stone lists her birth year as 1874, whereas her death certificate and census forms put her birth year more at 1876-1877. Photo Source: Findagrave.com, photographed by volunteer runner9. Oh those questions we wish we could have asked years ago, eh?! It's a mystery for sure! Very nice to get the photos through one of the FindAGrave volunteers - I've been very happy with their help with my across-the-continent-another-country ancestors! Yes, I am VERY grateful for the photos that findagrave volunteers have taken for me. I actually just took a grave photo for someone else this morning. I don't get the time to do it as often as I would like - maybe once the kids are in school next month. 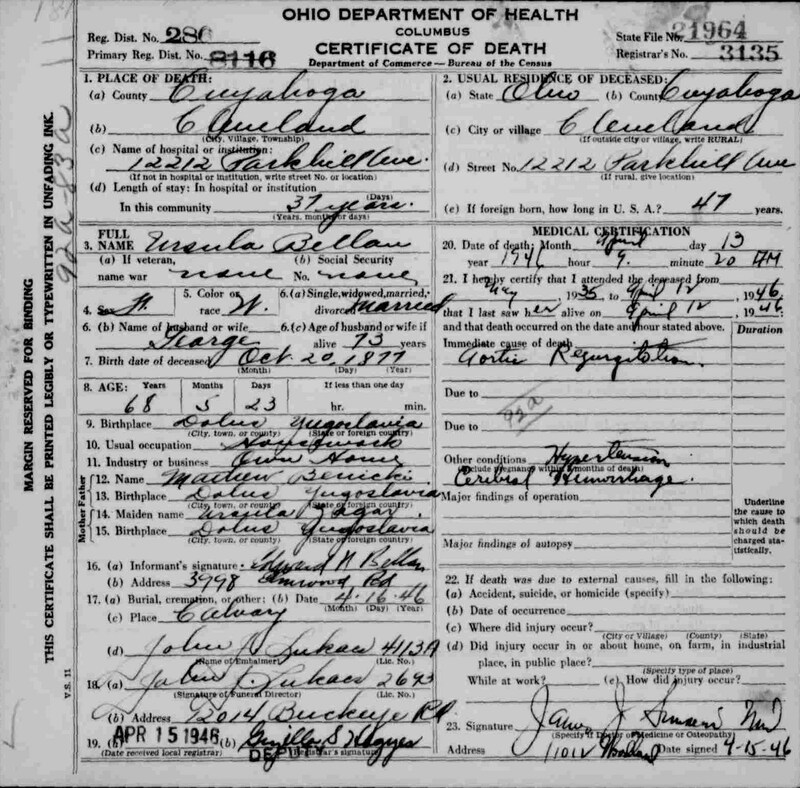 Emily, was his death certificate filed under the name "George" or under his Croatian given name? Another thought: there was an era in which immigrants came to this country wishing to do everything possible to blend in and avoid discrimination, and yet, these generations were followed by others who discovered the value of acknowledging their heritage. Perhaps that was the dynamic behind George's children's choice to revert to the originating first name, while having to maintain their link to the legally-adopted surname.